Alysha of The Savory Notebook has started a new club called â€˜Virtual Recipe Clubâ€™ where she has chosen to utilize this club to swap new recipes and share our favorites every month.This monthâ€™s (January) theme is â€“ Whole Grain Breakfast Foods that contain whole grains like whole wheat flour,wheat bran,oat bran,wheat germ,millet,whole grain cornmeal,oats,buckwheat or barley.I have chosen to highlight the benefits of including Finger Millet or Ragi as a highly nutritious whole grain in our diets. The Latin name of Ragi is Elusine Indica which is a traditional crop of S.India and is also known as the poor manâ€™s millet due to its long sustenance.The labouring farmers in our villages sustain on this whole grain which is more superior to rice or wheat in nutritional terms, being rich in proteins,providing highest levels of calcium,antioxidants properties, phytochemicals and high levels of dietary fibre which makes it easily and slowly digestable(hence helps control blood glucose levels in diabetics very effectively).The bulkiness of the fiber and the slower digestion rate makes us feel fuller on fewer calories, and therefore may help prevent us from eating excess calories.I have read this interesting article on fat loss with this wonder grain here ,where the author shows how we can manage to prevent obesity by incorporating ragi in our diet. I weaned my toddler to complementary foods to meet his nutritional requirements at 5+ months and one of the major health foods I gave him was ragi malt and research has proven that millet grains holds the key to a healthy, wholesome diet and has a better balance of vitamins and minerals than wheat, barley, oats, rice or rye.It has amazing amounts of iron, Vit B, complex protein, amino acids, phosphorus,magnesium and potassium and can be given to babies from age 5+ months as baby food like a porridge or combine it with milk/yogurt/veggies/fruits which is a complete nutritious baby meal.Ragi flour cooked with a little milk and sugar is a tasty and easily digestable breakfast cereal. Our farmers and labourers,over the centuries have traditionally used ragi as an essential whole grain in their diet,especially in Karnataka and Andhra Pradesh states and most of their nutrition comes from the traditional Ragi Mudde (Kannada) or Ragi Sankati (Telugu) which is eaten in the morning with a chilli, onions, sambar (lentil based stew)or meat curry and helps them sustain throughout the whole day. 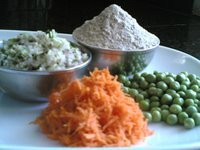 Similar to chapatis or parantas which are wheat flour based,we can prepare ragi rotis from ragi flour.Ragi roti is a traditional Karnataka breakfast dish prepared from ragi flour,fresh grated coconut,onions and green chillis.I usually prepare these ragi rotis with different vegetable stuffings using carrots,peas,cauliflower,drumstick leaves(mulaga akkulu)and methi leaves for added flavour and nutrition. A highly nutritious and healthy food,Ragi Roti,making its entry for this month’s Wholesome Grain Breakfast Food theme of Alysha’s Virtual Recipe Club. Mix all the ingredients, except oil. Add just enough water to make a firm dough. Divide big lemon sized balls.Take a plantain leaf or butter paper or a plastic foil and place a ball on it and flatten with your fingers spreading it as thin as possible into a circular shape of approx 6″ in diameter. Pre-heat the griddle spreading a tsp of oil and carefully transfer the rolled out ragi roti onto the griddle. Cook for about a minute,flip and cook for another minute.Keep flipping till its well cooked on both sides. Serve hot with chutney.I like to eat my ragi roti with curd and lime pickle. The traditional Ragi Sankati of Rayalaseema fame has been blogged by Indira of Mahanandi in her blog and you can find an authentic recipe of famous traditional Kannada Raagi Mudde here. What a coincidence! 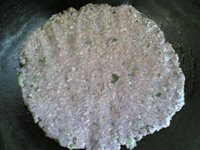 I posted on sorghum rotis! Its good to go back to our roots isnt it? 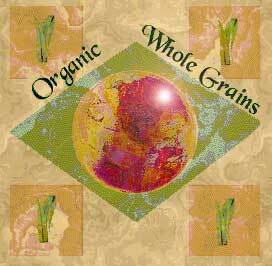 I am trying to include more whole grains and this is a good recipe. Thanks. I so hope I can find Ragi here in Montreal’s indian stores. It sounds like a “miracle breakfast food”. I also wanted to tell you I tagged you for a meme today about your cookbooks. Is plain ragi poridge enough for 5 months old baby? will it be easy on their digestive system, i always thought to give it after 1 yr old. Anonymous,I started my son on semi-solids when he was almost 6 months as suggested by our doc.I started by giving a tsp a day and slowly increased it.The amount and thickness of the porridge should be gradually increased.They can easily digest.Watch them closely and check with the doc before putting the baby on semi-solids like rice and ragi. This was interesting to read about, there are so many new things to learn! Thanks Sailu! A very good and tasty recipe. I make this and serve it with sesame chutney and its amazing… and sustains longer. This one is definitely nutritious! 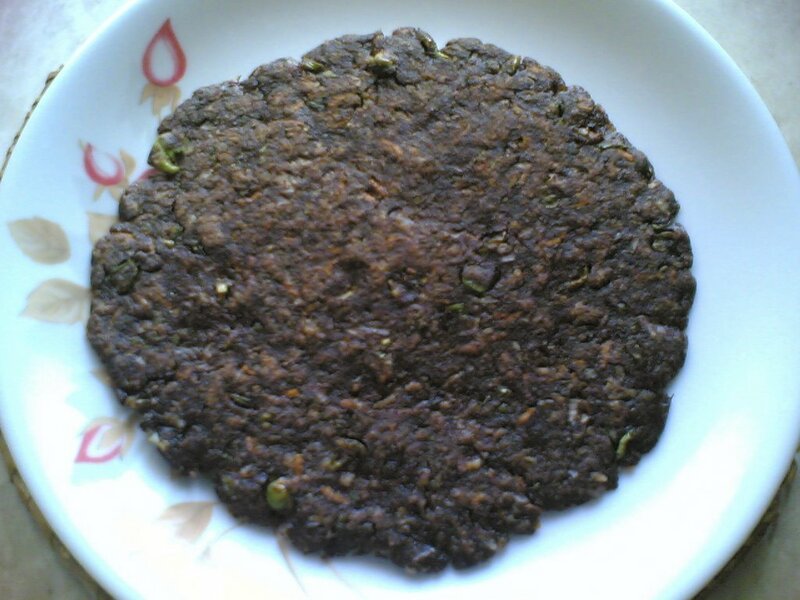 Is Ragi flour same as bajra? It looks like it in the ingredients picture. When bajra roti is placed to roast on the tawa, I usually dampen the top side with water so it doesn’t dry out and crack. Next time I will try it with oil, since my rotis turn out slightly dry. Thanks, I am reading all these excellent ideas on blogs these days, I need to come up with an easy way to keep track!! I am going to make this one for sure sailu. I am very fond of ragi. Thank you for your wonderful recipes, altho i havent tried them all, i just love to look at these sites when i long for south indian food. I’m a total ragi freak, i have Ragi Malt with milk everyday for breakfast and it keeps me feeling full till lunch no hunger pangs whatsoever. its the best. I reckon Ragi has low GI. I am a Gujarati and came to know about Ragi six months ago. Just have bought a packet of the flour and all set to try the Roti and the Ragi Rice balls as per these recipes and of course from mahanad. Gujarati’s try a lot of unknown foods these days but the idea of healthy eating is not so much in favour. 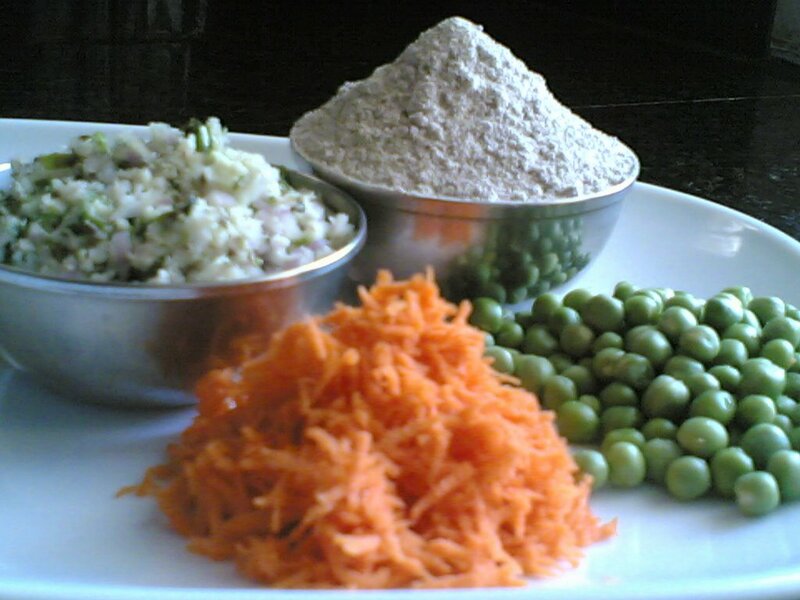 May be your website will get a frew unusual Gujaratis into trying Andhra and Kannada recipes. hi sailugaaru ,memu karnataka nunchi maa regular food ragi mudda.inakani ragilo unna nutritions & health support chese contains eamy ani total details isthe chala upakaram untundhi . I am in love with millet or Ragi. So I desparetly need to know where I can buy it. Please help find where I can buy it,I will appreciate.Thank you. ragi dosa and roti .good for my health.mild sugar patient…. my grand father daily eat ragi and life span extended with sugar tablets…i recommend for type 2 patient. I would like to know the recepie for making Ragi Malt. hi,i need to know how to make a ragi drink .i need to know how to make it interesting and creative for my four year old son. Hi, Can someone tell me how healthy is ragi ? What r the benefits it has when u eat on regular basis. HI Sailu garu, I tried this… taste is excellent but i had a problem. roti vattetappudu… adi virigipotundi…so i had to apply oil on my hands, is there any way to press it without using oil? please help me..
Sailuji, I tried this… but roti pan meeda veseppudu virigipotundi… tried using both oil and water but couldn’t make it. Finally i ended up adding more water and pouring the batter as dosas… taste is good… but missed rotis… can u suggest wjhere i could have gone wrong?